Want to improve your legato technique faster, but don’t know how? You don’t need any special or secret exercises to reach this goal. 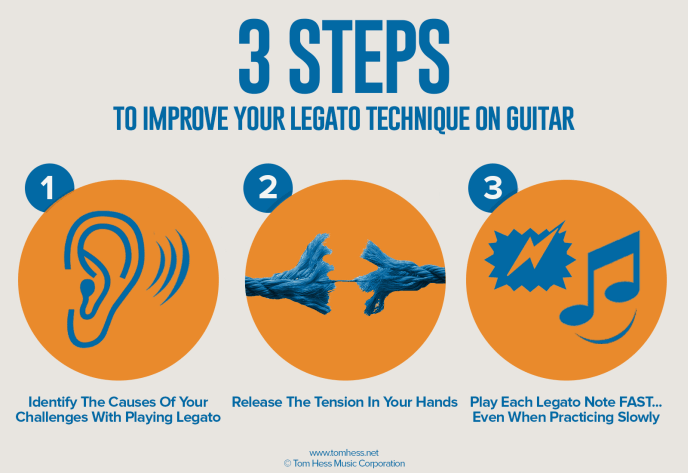 What you need is to learn how to practice legato correctly and effectively like the best guitarists do. When you do this, all legato licks you play will instantly sound better (because your improved technique will carry over to them). Make incorrect assumptions about the causes of their legato playing problems, which lead them down the wrong path and make their problems with this technique harder to solve. Think that their problems with playing legato will be solved by looking for lots of new licks and exercises. Instead of trying to improve your legato technique with more exercises, practice isolating your mistakes and analyze every motion your fingers make, looking for the root of the problem(s). This will tell you exactly what to improve in your technique to make all your legato licks sound better. If you struggle with going through this process yourself, seek out a guitar teacher who will show how to do this correctly. To see an example of this process at work, watch this video where I walk one of my guitar students through the process of improving legato technique. Begin playing a legato lick using your normal amount of tension. Gradually use less and less tension until you are using so little tension that the notes of the lick begin to sound weak and sloppy. Add just a little tension back into your playing so your notes sound clear and articulate. Your goal is to find and use just enough tension so that the notes sound clearly… no more, no less. To make your legato playing sound clean and fluid, you must learn to articulate every note using faster movements. Note: This does NOT mean to “play the notes at a faster tempo”. You can let each note you play ring out for a long time even while making fast movements for each hammer-on/pull-off you play. This will allow you to articulate each note with a lot of power, without excessive tension (making fast legato playing super easy). To better understand this, imagine snapping your fingers loudly. To increase the clarity and volume of the sound made by the snap, you would need to snap your fingers quickly, vs. snapping them harder. If you try to snap your fingers with a lot of power, they will move slowly and the snap will not be articulate. The same concept applies to your legato guitar playing. Watch the video mentioned earlier in this article to see this concept illustrated on guitar. Now that you know how to improve your legato playing, take a few minutes to learn if you are on track to master all other guitar techniques needed for your musical goals. Take this lead guitar technique assessment to find out how close you are to becoming a great guitarist. Become the guitarist you’ve always wanted to be by studying the best guitar lessons online.